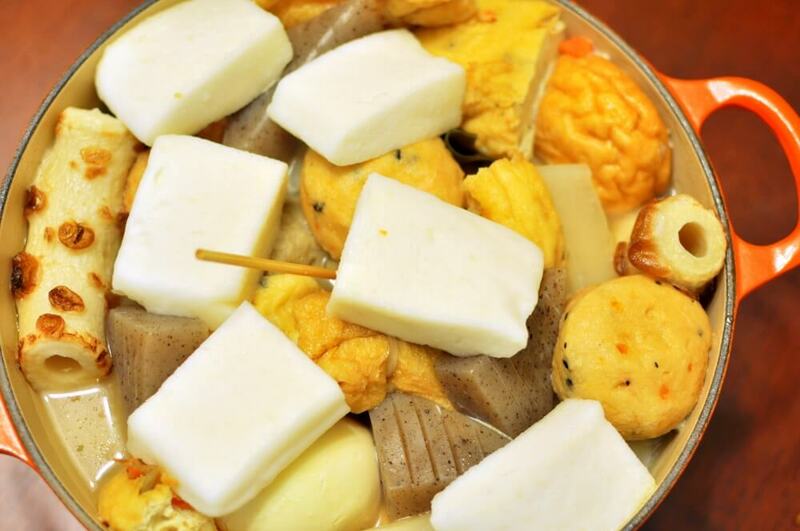 Oden おでん is a popular hot pot dish often consumed in winter in Japan. Depending on the region sometimes the ingredients are skewered and simmered in the broth and then eaten almost like Yakitori (grilled meat on skweres) This hearty stew/broth typically consists of daikon radish, konnyaku (yam gelatin), fish cakes, potatoes, fried tofu, vegetables and boiled eggs as common ingredients. Recipes can vary depending on households and regions. The hot pot dish needs to be simmered 2 to 4 hours in preparation to get the flavors absorbed. Therefore, oden can be found under the categories of nimono 煮物 (simmered dish) or nabe 鍋 (hot pot dish) in restaurant menus. In Tokyo and most of kanto area, soup stock for oden is made with boiling dried seaweed or kombu 昆布 and dried katsuo flakes in a large pot of hot water. Tokyo oden started out as a meatless dish. With limitless supply of fresh fish from Tsukiji market, oden has now evolved into different seafood specialities, especially in restaurants and izakaya around Tsukiji market. In Aomori prefecture, grated ginger is mixed with miso sauce and poured over oden before serving; a recipe derived from oden sold at street stalls or yatai 屋台. In Shizuoka, soup stock is seasoned with dark soy sauce. Beef tendon, chicken, kurohanpen 黒はんぺん (fish cake made from sardines and mackerel) and potatoes are often used. Aoba Oden Street, a restaurant street with a post-war theme, offers ample tasting opportunities of Shizuoka’s dark oden. In Okinawa, pig feet simmered in pork-based broth is the local oden speciality. Oden is said to have originated around 14th century during Muromachi period. It started out as dengaku 田楽 , skewered grilled tofu topped with miso sauce. As time passed, “dengaku” became shortened to “den” with the honorific “o” in front of the name; hence “oden”. Tofu stew gained popularity during Edo period and eventually konnyaku, eggs and other ingredients were added in the preparation after Meiji times. 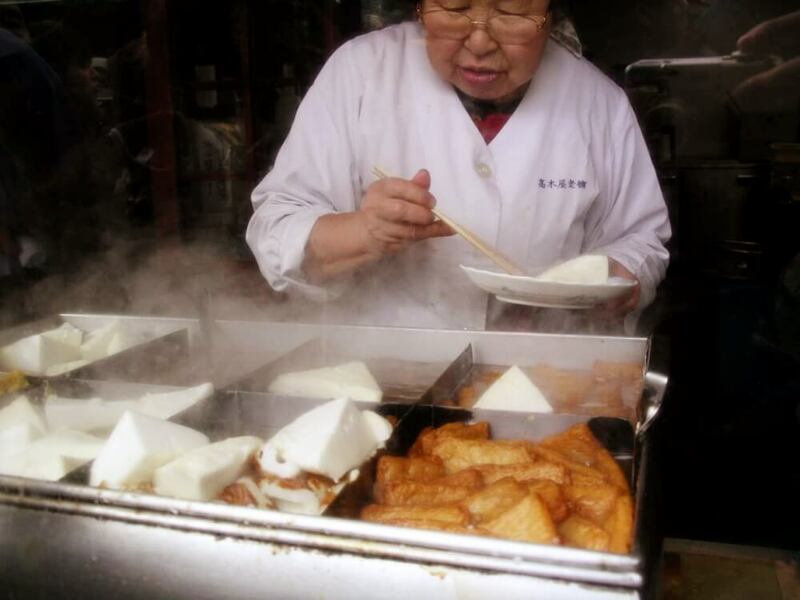 Oden was first served in street stalls. It is now widely available in izakaya, restaurants, convenience stores and canned products in vending machines. Oden is simple to prepare. Although oden recipes vary regionally, most start with boiling kombu in water. Next, peel and cut daikon radish. Place in water and let simmer for about an hour. Add potatoes, hard boiled eggs, fish cakes, tofu, konnyaku and the rest of the ingredients. Cook for 20 minutes or until desired time. Add soy sauce to taste. The longer the simmering the better the flavor. Prepare mustard (karashi 芥子) to be mixed into broth and serve with sake. This is the basic recipe for making oden. Ingredients are readily available at most supermarkets. Prepackaged sets can often be purchased at grocery stores. If you are super short on time, try to find the canned oden in vending machines and add more ingredients as desired. 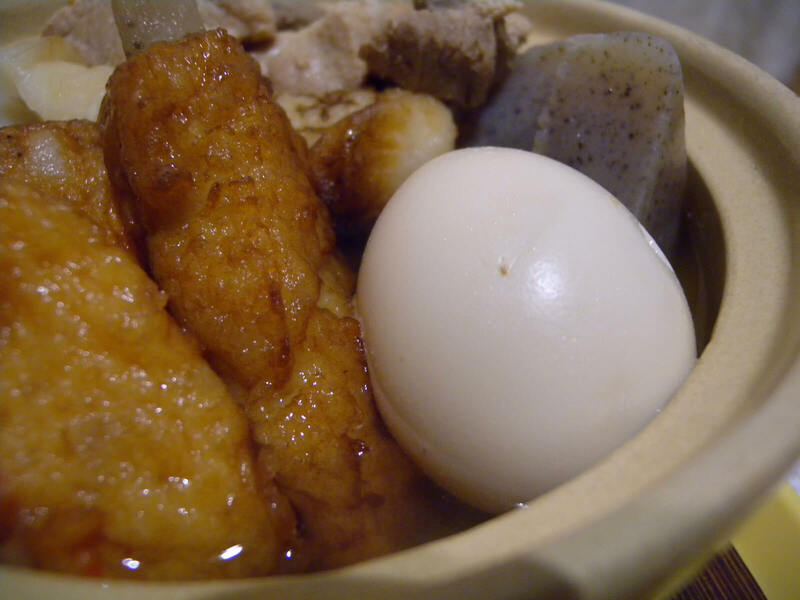 Oden is a light and easily digestible Japanese stew, very warming in the cold winter months. The savory flavor goes well with rice, noodles and sake. This comfort food can be enjoyed solo or with a group of friends. Oden is widely available in restaurants, izakaya and convenience stores. Book a tour with Arigato Japan Food Tours to try seasonal foods this winter.